Product #20646 | SKU PCT40 | 0.0 (no ratings yet) Thanks for your rating! The PCT-40 from Pyle-Pro is a professional-quality audio cable tester that allows you to test a variety of cables with a single device. 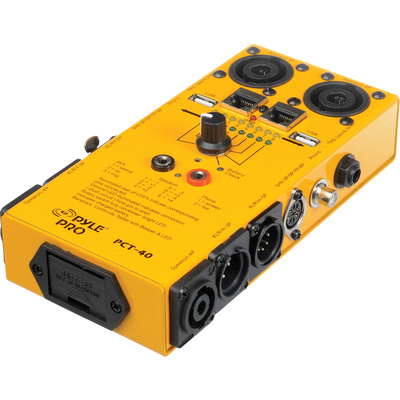 The unit can test cables with a combination of USB, 1/4" TRS, 3-Pin XLR Male and Female, 5-Pin XLR, RCA Phono, 4-Pin Speakon, 4-Pin S-Type, 3-Pin Din, 5-Pin Din, 8-Pin Din, and RJ-45 connectors. The tester has an 8-way switch allowing you to make quick cable selections. LED indicators confirm each conductor's continuity and connection, as well as battery and ground connection status. The rugged metal housing is designed for a long life of professional use. The unit operates on a standard 9 V battery.